Are you looking for the best gold detectors? Finding the right piece of gold prospecting equipment takes careful consideration of your exact needs, what types of gold you are planning on prospecting, how deep in the ground you want to search and also how serious you are about gold prospecting. There are so many metal detector characteristics that should be taken into account like special modes, operating swing speed, weight and many specialty features that should be considered. No matter what metal detector you choose, be ready to spend at least $500 for a high quality gadget that will allow you to maximize your investment. Besides finding the best gold detectors consider getting a pair of high quality headphones, a trowel and a carrying case for your metal detector. 1. The best gold detector for novice gold prospector is Fisher Hobby Gold Bug metal detector that is priced at around $500 and comes with a 5 year warranty. This particular metal detector is the best while searching for natural gold nugget with its 5” search coil. 2. Tesoro Vaquero Metal detector is an ultimate multi function metal detector modestly priced at around $450. The machine is very versatile and allows its owners to choose custom settings according to soil mineralization levels. 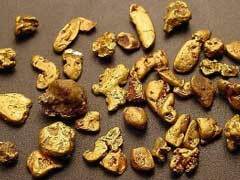 It’s ideal for searching for old gold coins, gold nuggets and virtually any gold deposits. Tesoro Vaquero is among the best gold detectors in the price range. 3. For more serious mid level gold prospectors consider Minelab Eureka Gold allowing gold prospectors to search even for the smallest gold flakes at greater depths. The unit is priced at around $1,000, however it comes with a whole range of added accessories, including a carrying case, gloves and treasure finds case. 4. Fisher F-70 is a powerful piece of equipment for gold prospecting. This metal detector comes with a double discrimination filter to sort through worthless pieces of metal like nails, aluminum cans and else. With its average price at $700, it’s a great piece of gold detecting equipment to consider. 5. Garrett Infinium is the ultimate professional metal detector allowing you to search for gold on land and under the water. It comes with brand new technology called Advanced Pulse Induction giving this metal detector an edge over other comparable models. Gold prospectors can travel anywhere in the world and search for old relic coins, gold nuggets, gold flakes virtually under any soil mineralization conditions. Maximize your gold value finds with the best gold detector in its class! Looking to purchase gold sluice equipment, scroll over and read other articles on our website.